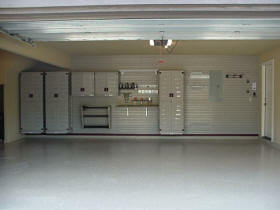 Your garage flooring can take on different types of damage throughout the years. Whether it be grease stains, abrasions or paint smears, your garage has seen it all. One way to protect your garage floor is by applying a reliable protection coating. This not only provides a layer of strength but also grants a sophisticated appearance. However, before venturing into this project it is important to understand the difference between different types of coating. This allows you to see which works with your budget and lifestyle. Applying a new coat of pain can help with the unsightly appearance of grease and other stains. One popular option for garage floor is latex paint. This type of paint is easy to clean and is appropriate for garage flooring. This option is a clear or semi-gloss coat that does the job of warding away moisture and abrasions. This sealer is also great for colder areas where salt is frequently applied to roads. This option is one of the more budget-friendly. While many stores offer DIY kits, the cleaning and sealing process of concrete sealer is a complicated process. Therefore, it is recommended to hire professionals to help your sealer last longer. This type of coat is specifically formulated with resins and hardeners. With both of these components, it is thicker and more durable than regular paint. This provides a good mix of functionality and sophisticated appearance as many epoxy coats leave a great-looking glossy finish. Keep in mind that the cleaning, mixing, sanding and drying process of this type of coat can be complicated. Thus, it may be better to contact garage flooring professionals to avoid mistakes. Each of these different options provide several unique pros and cons. Consulting with a professional flooring company can help you come to conclusion on what coating is best for your lifestyle and budget.